The Auckland Development team to play the Wellington Development team for the Chanticleer Cup has been announced. Allan Fletcher, Pam Jenkins, Virginia Kirk, Lani Mailei, Thierry Pannetier and Selwyn Sainty. Grant Gardiner, Diana Glazumina, Glen Glazumina, Leslie Haines, Seti Mailei and Angela Maxted. 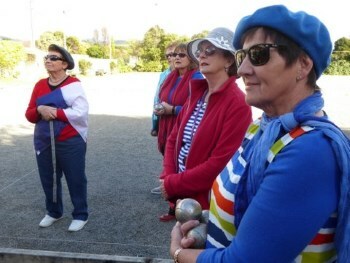 The match will be held at the Manawatu Pétanque club over the weekend of 26-27 August. 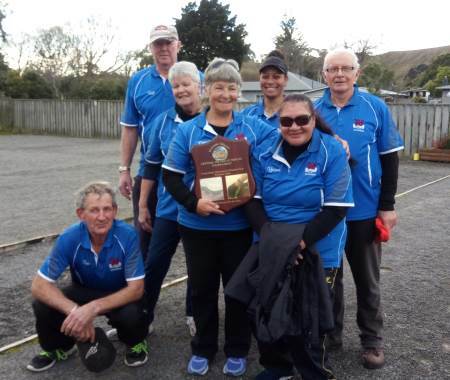 Wanganui East successfully defended the Central Districts Trophy at home on 2 July. Given the dire weather predictions, our decision to hold the mêlée on Tuesday, 11 July was fortuitous. The sun was shining most of the time and the colourful, French inspired clothing, added to the scene. The imagination some members showed was original to say the least. Special mention goes to Roy Buchan who made the most of what I had , turning up in red rugby jersey, royal blue beanie with the most curious bit of material dangling from one ear. When asked, he explained that it was a red sock and as he could not find the other, decided to be creative and keep one ear warm. As usual, Tony Gatford did a splendid job of organizing the day, ably assisted by Graham Hooper, President of the club. 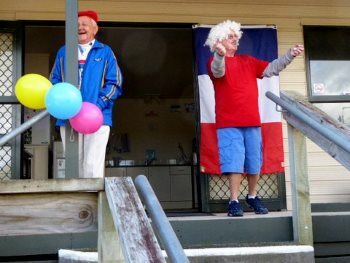 Tony, having explained the rules of the mêlée, (in French, then English) played a rousing version of La Marseillaise for players to sing along to. I think Tony may have missed his calling, putting on a superb show as a conductor. Three games were played, after which drinks and nibbles were in order. The usual diversity of food was appreciated by all. Lindsay McCallum and Michelle Maxwell 9 equal. Upper Hutt’s second defence of the Jacques Cochonnet Trophy was at home to Manawatu. A slow start by the holders saw them down 0-3 after the first round. In the second round, Upper Hutt closed the gap slighly to trail 2-4. 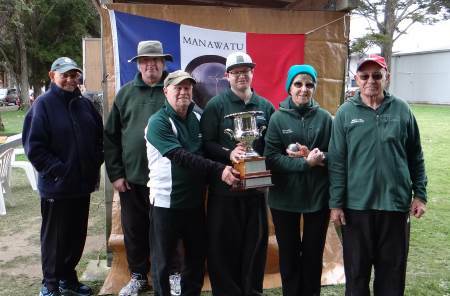 However, in the final round Manawatu picked up two wins to secure the Trophy for the second time. 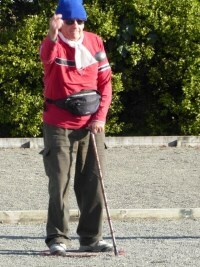 Manawatu’s first defence will be away to Otaki. The Wellington Development team to play the Auckland Development team for the Chanticleer Cup has been announced. Steve Frampton (Kapiti), Yvonne Futcher (Wanganui East), Dave Gatchell (Horowhenua), Kevin McFadgen (Kapiti), Trish Smart (Manwatu), Ron Sandilands (Manawatu). David Corley (Manawatu), Tony Gatford (Kapiti), Ann Hogg (Otaki), Marc Khull (Manawatu), Shirley MacDonald (Otaki), Sheryl Parslow (Wanganui East). Graeme Morris and Alan Taylor. David Corley and Ron Sandilands will make their Wellington Representative debut.